The great thing about a food truck is that you can do things that wouldn’t make much sense in a brick and mortar place. 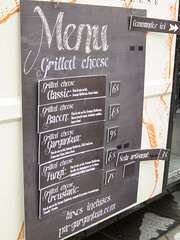 In P & A Guargantua’s case, their truck does what it says on the tin: they make grilled cheese. And aside from a few other minor menu items, that’s basically their whole menu as well. But the trick here is that by focusing on one basic thing, they can do it really well. They got some really good bread as a foundation. They’ve worked with a several Quebec farms to bring in some really excellent cheeses. And then adding some toppings like good tomatoes, bacon, or mushrooms. In our case, we tried two different sandwiches. 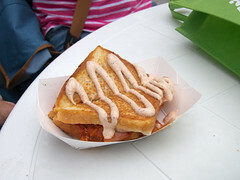 I went for the grilled cheese with bacon, while Carol opted for the Gargantua, with chili con carne and cajun cream. Both were quite good. 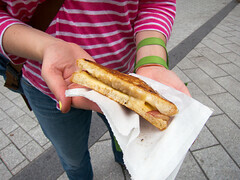 My grilled cheese and bacon was quite nice: they’ve master the art of making a grilled bread without it soaking up entirely too much butter, so it was a pleasant and crispy sandwich without being heavily greasy. Add in a pleasant, nicely melted Quebec cheese (not sure exactly the type, but it was like a white cheddar) and some nicely cooked thick slab bacon, and this was a great sandwich. Carol’s Gargantua was even better; despite some mixed experiences in the past with “Canadian chili”, this was a decent chili con carne, and it combined with the rest of the sandwich to make a pleasant little lunch. 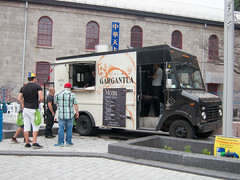 Overall, we were very pleased, not only with P & A Gargantua, but with the overall Montreal food truck scene. I hope it continues to flourish.